About six months ago I became obsessed with Texas chocolate sheet cake and went on a hunt for the perfect recipe. The only problem? Texas sheet cake is baked in a half sheet pan, which is too large for the average Australian oven. 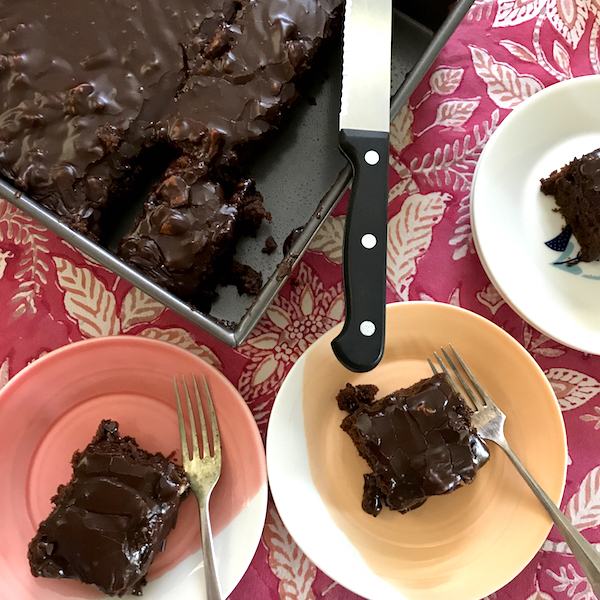 I thought about getting a quarter sheet pan and halving the sheet cake recipe but it seemed a bit pointless, because sheet cakes are all about feeding a crowd, it is a cake that is made to party. I made a few different sheet cake recipes and just made them in higher, smaller pans with some success until I discovered the Denver Chocolate Sheet cake which has all the elements of the crowd feeding Texas sheet cake but it’s about an inch higher and the 33x22cm (13×9 inch) pan fits in smaller Australian ovens. There are a few notes on this recipe: Use natural cocoa powder because it’s slightly acidic and combines with the bicarb soda as a raising agent. The malted milk powder is optional but it does add nice toffee and malt notes for a deeper more complex flavor. If you do buy some malted milk powder you can try it other cakes or desserts. Stella Parks calls malted milk powder the umami bomb of deserts and uses it a wide range of baked goods including these fabulous browned butter shortbread cookies. The original recipe calls for baking the cake until a skewer comes out clean but when I did this my cake was overcooked and dry on the edges, so I bake the cake until the centre is firm and your finger leaves a slight indentation when pressed. It’s always better to err on the side of under cooking chocolate cake. Do buy the best cocoa powder you can find because it has a higher fat content, but I have made this cake using ordinary old Nestle supermarket cocoa and it’s still been mighty fine. Traditionally this cake is a mild and milky chocolate cake but use more cocoa powder if you want fudgier more brownie like cake – They are all good! Grease a 33 X 22 X 5cm pan and dust with cocoa. Combine flour, sugar, bicarb soda, salt and malted milk powder (if using) in a large bowl and whisk together. Combine butter, cocoa and 1 1/2 cups of water in a medium saucepan over a medium low heat, stir frequently until butter has melted and the mixture is smooth and glossy and bubbling around the edges. Fold cocoa mixture into dry ingredients until just combined. Stir in buttermilk, eggs and vanilla until combined. Pour batter into prepared pan and bake until cake has risen and puffy about 25-30 minutes. The centre should be firm to touch but leave a slight indentation when touched with your finger. Spread warm icing over warm cake and smooth with a spatula. Allow icing to become firm before slicing cake.